I was down in Northwest Arkansas over the weekend for the Walmart NW Arkansas Championship, one of the stops on the Ladies Professional Golf Association (LPGA) tour. More about the tournament in a minute, but I was really impressed with the way Northwest Arkansas has grown. When Patty and I started going to Hot Springs, AR, for the horse races back in the 1980s, there wasn’t a lot to see or do in that part of the country. There is a run of four cities in the space of about 10 miles — Bentonville, Rogers, Springdale and Fayetteville. Bentonville, the home of Walmart, was a sleepy place, with a Holiday Inn (where Sam Walton had breakfast or coffee every morning) and the town square. Fayetteville, home of the University of Arkansas, was — and still is — the largest of the four cities. Springdale and Rogers were just a couple of red-light-heavy cities you had to endure before you could get back up to speed on U.S. 71. Bentonville, Rogers and Fayetteville have grown considerably, but Bentonville hit the jackpot a few years ago, when Alice Walton, one of Sam’s daughters, developed the amazing Crystal Bridges Museum of American Art. Bentonville was growing on its own, but Crystal Bridges put it on the must-go-to list, if you’re in the area. Saturday night I went to the town square for dinner, and hundreds of people were out and about, many dining at the restaurant I had gone to — Table Mesa — and others just walking around or visiting ice cream shops or other establishments. Rogers, immediately south of Bentonville, has grown by leaps and bounds, too. Sunday morning I had breakfast at a 24-hour restaurant called Lucy’s Diner, a couple of blocks from the city’s “historic” downtown district. Lucy’s was packed, and the waitresses were abuzz about the pending birth of a colleague’s baby. The area of Rogers that seems to have mushroomed most is Pinnacle Hills, a prosperous area just off I-49/U.S. 71. The area features a modern, sprawling shopping district and lots of fine homes. The trigger for the development was Pinnacle Country Club, which was constructed on farm land and opened in 1990. 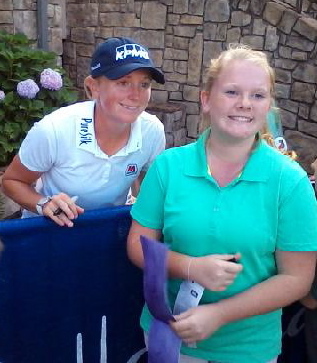 The LPGA tournament has been held at Pinnacle the last nine years, and the local favorite is Stacy Lewis, currently the third-ranked women’s player, who attended the nearby University of Arkansas. She won the tournament last year. This was the second time I had attended this tournament. The first time, a few years, ago, it was blisteringly hot and breathtakingly humid — so much so that I had to stop following a particular group and retreat to the clubhouse area. This time, the temperatures were in the 80s and a nice wind was blowing, particularly on Sunday. On Saturday, I followed Suzann Petterson, the fifth-ranked player, and I began following her again on Sunday but dropped out after nine holes because she was far out of contention. As I was deciding whom to follow next, I got swept up in a crowd that I followed to the 10th tee, where none other than Stacy Lewis was about to tee off. Lewis, playing in the second to last group, was tied for the lead with one of her playing partners, Mika Miyazato, and Na Yeon Choi, who was playing in the last group. Lewis took the lead after Miyazato double bogeyed the 13th hole and Choi, playing behind them, bogeyed it. Miyazato got one back at 16 with a birdie, and Lewis held a one-shot lead over her two closest competitors going into the Par-3 17th hole. Things were shaping up beautifully for the local favorite. No. 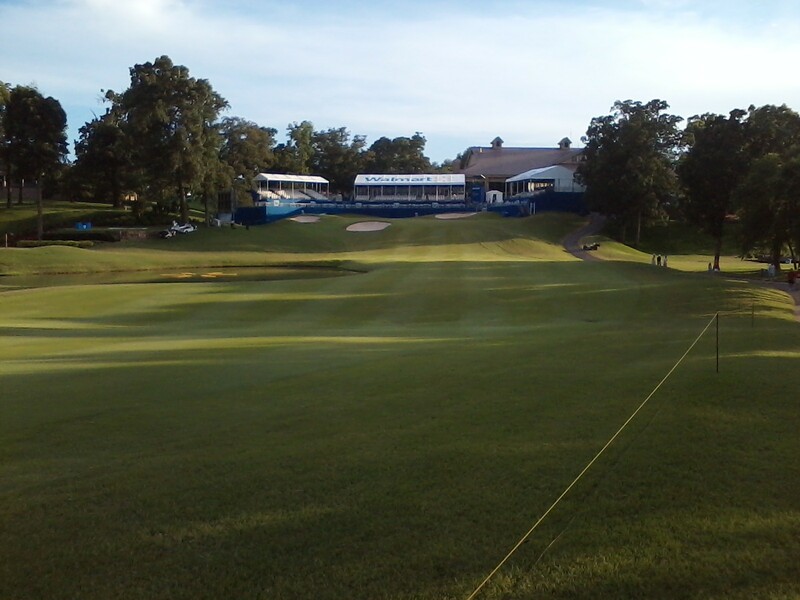 17 green is surrounded on three sides by grandstands, and the fans are encouraged to get loud. Pinnacle is promoting the hole as the “loudest on tour,” and the fans did their best to justify that when Lewis arrived at the hole Sunday. To huge cheers, Lewis put her tee shot six to eight feet from the hole, for a very makable birdie opportunity. Miyazato, meanwhile, put hers 25 to 30 feet away. As the players walked toward the green, the crowd was doing the “woo pig sooie!” call, and a smiling Lewis urged the crowd on by waving her arms up and down and applauding the fans. I looked at Miyazato to see how she was handling the outpouring of exhortation and affection for Lewis, and, to my pleasant surprise, she was also smiling…Good sport. Then, the tables started to turn. Miyazato made her long putt, and Lewis missed the short one, to a collective groan from the crowd. That put them in a tie going into the last hole. But then, before either of them hit another shot, the table flipped onto its top: Word came that Choi, who had been one shot behind, had eagled the Par 4 16th hole. With one swing — a 135-yard shot that she holed out — Choi had gone from one down to one up over both Lewis and Miyazato. After Lewis and Miyazato hit their drives on the Par 5 18th, more shocking news came: Choi had birdied No. 17. With three consecutive swings, Choi had gone from one down to two up. That meant Lewis and/or Miyazato had to eagle the Par 5 18th hole. It didn’t happen. Choi parred and Lewis bogeyed. As I watched from the grandstand, Choi put her third shot on the green and two-putted for the victory. Seconds after Choi holed out, a friend or relative ran onto the green and gave her a champagne bath, instantly making her white pants transparent. In her victory speech, a smiling Choi thanked the crowd, the volunteers, the sponsors and the LPGA. Then she was off to the autograph line. …It was a tremendous event in an increasingly dynamic part of the Midwest/near South, and I hope to be on hand next year, when the tournament turns 10 years old. The University of Arkansas has an interesting strategy to broaden their freshmen enrollment. Five adjacent states also enjoy instate tuition. Many KC area students have benefited and many have then stayed after graduation. Jim, I’m letting my bias show. I so want to see more journalism and less daily life at the juncture of your blog–to which I’ve recently become happily addicted. There is such a dearth of journalism “inside baseball” available to us newspaper dinosaurs anymore. I’m surprised you haven’t had anything on the Star’s discreet dismantling of the business desk. He has a point, apparently not many golfers among your devoted readers and even fewer devotees of women’s sports. I’m glad to hear you’re on board with the blog, Keenan…But I’m probably going to stick with the daily life/journalism mix because each dimension seems to appeal to a different set of readers and yet there’s a decent amount of overlap. Too much journalism would make the blog too narrow, and too much daily life would run off many of those looking for serious commentary. Besides, as daily newspapers have waned, the number of journalism junkies has diminished. They’ve had to move on, just like many of my former KC Star colleagues have had to reinvent themselves and leave the “black and white” behind. …I applaud Diane Stafford, Mark Davis and Joyce Smith for hanging on and continuing to do outstanding work. They turn out an amazing amount of quality copy. Joyce Smith seems to be one of the nicest people there. And, she has never failed to respond to one of my emails, unlike two other columnists / “bloggers” I’ve written to. When I mentioned this to the public editor he said some columnists get too much mail to respond. That couldn’t possibly be true of these two vs Ms Smith, and yet she always takes the time to answer. Sadly, I’m told, effective next month, Diane, Mark and Joyce will no longer be on the business desk. Nor Greg or Keith. Don’t get me wrong. I like the daily life entries.